At the end of 5 days Tech Camp training in Kano on Countering Violent Extremism organised by Farar Tattabara Kano_Equal Access International ,the girl child education group consisting of Mark, Adamu, Hadiza, Hauwa, Hannatu, Khadija and Lilian created a whatsapp group and facebook group for group talks and social media awareness campaign. We have all engaged our followers on our individual handles on twitter, facebook, whatsapp and instagram. Girl child group members Khadija Ahmed Abbas, Hadiza Ahmed Aminu and Adamu Yabagi Muhammad. 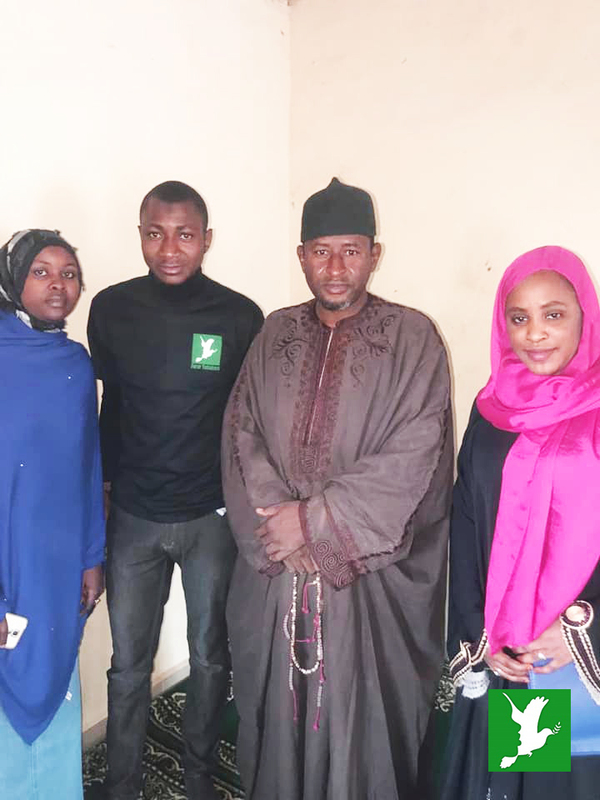 The girl child education group Kano paid an advocacy visit to Chief Imam of Giginyu Mosque Kano as part of their campaign. The Chief Imam, Mallam Habibu Umar who started by giving a background knowledge on the roles females played during the revelation and dispersion of Islamic education during the period of prophet Muhammad SAW, outlined how the beloved wives of Holy Prophet Nana Khadijah consoled him when angel Jubril brought him the first revelation and how the Holy prophet trained Nana Aishat who later became teacher to both male and female and one of greatest scholars in Islamic history. Mallam Umar further said Islamic and western education are interwoven, starting that an educated wife helps a lot in building a strong, enlightened and peaceful home as training and education of every child start from home. He also stated that God endowed women with a very soft heart which is a reflection of love and pity, and if coupled with education makes them a good peace builder in the society. He finally concluded by telling us about the work they have been doing on how more women can be included in governance in Kano state which can only be actualized when they are educated, he then admonished parents to enroll their children most especially girl s into school so that in the nearest future, we will have more number of female nurses and doctors in the community. On the other hands, Mark Nuhu Mabudi who is also a member of the group paid an advocacy to community leaders of Lawishi, Shongom LGA Gombe state As part of the activities, He had a meeting with the two community heads of Lawishi where he will be working on January 2, 2019 at around 8am at the senior head’s resident. Things discussed: He introduced the project to them and told them by the end of the project, he will like to enroll 2-3 girls back to school who dropped out of school for one reason or the other. He asked for permission to carry out the project in the community which they happily granted. How to mobilize parents and girls when it is time to meet them face to face. They expressed their delight with the project and pledged to support it in their own way.